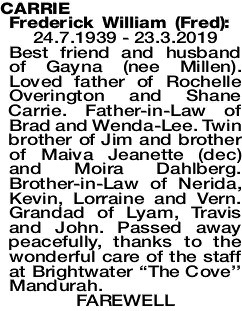 24.7.1939 - 23.3.2019 Best friend and husband of Gayna (nee Millen). 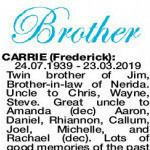 Loved father of Rochelle Overington and Shane Carrie. Father-in-Law of Brad and Wenda-Lee. Twin brother of Jim and brother of Maiva Jeanette (dec) and Moira Dahlberg. Brother-in-Law of Nerida, Kevin, Lorraine and Vern. Grandad of Lyam, Travis and John. Passed away peacefully, thanks to the wonderful care of the staff at Brightwater “The Cove'' Mandurah. 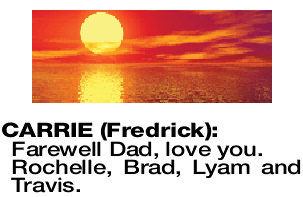 The Funeral Service for Mr Frederick William (Fred) Carrie of Mandurah will take place in our Chapel, 2 Leslie Street Mandurah commencing at 10:30am TUESDAY (2.04.2019). Cremation will take place privately at a later time. 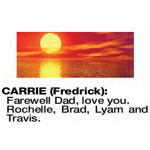 CARRIE FREDRICK Farewell Dad, love you. Rochelle, Brad, Lyam and Travis. 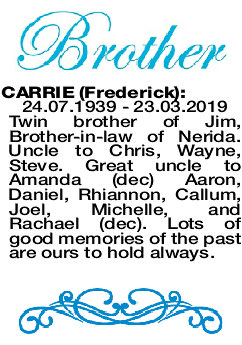 CARRIE FREDERICK 24.07.1939 - 23.03.2019 Twin brother of Jim, Brother-in-law of Nerida. Uncle to Chris, Wayne, Steve. Great uncle to Amanda (dec) Aaron, Daniel, Rhiannon, Callum, Joel, Michelle, and Rachael (dec). Lots of good memories of the past are ours to hold always. 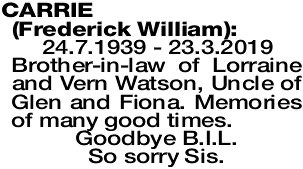 Loved Big Brother of Moira, Brother-in-law of Kevin, Uncle to Rodney and Brenton. 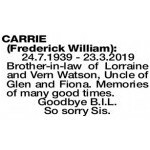 FREDERICK WILLIAM 24.7.1939 - 23.3.2019 Brother-in-law of Lorraine and Vern Watson, Uncle of Glen and Fiona. Memories of many good times. Goodbye B.I.L. So sorry Sis.